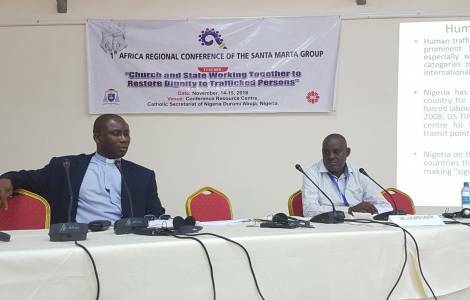 Abuja (Agenzia Fides) – The Church and the government in Nigeria must work together to restore the dignity of victims of people-trafficking said Archbishop Augustine Obiora Akubeze of Benin City also President of the Catholic Bishops’ Conference of Nigeria speaking at a Conference “Church and state working together to restore the dignity of the victims of human trafficking”. The conference was held in the federal capital Abuja. “Our collaboration with the government must supply financial, spiritual and legal assistance for the victims” said Archbishop Akubeze. The archbishop added that “pursuing those responsible for the crime of human trafficking is also a way to restore the dignity of the victims. Our laws must ensure that those directly responsible for human trafficking are brought to justice". Speakers at the meeting organised by the Sancta Marta Group African Regional Conference in collaboration with the Catholic Caritas Foundation of Nigeria (CCFN), included Cardinal John Olorunfemi Onaiyekan, archbishop of Abuja, who reminded the government of its responsibility to improve the national economy adding that with improved living conditions Nigerians would be less inclined to attempt illegal emigration and end up as victims of organised crime. The Cardinal denounced “the most atrocious form of human trafficking, sexual exploitation of children and minors, activities controlled by criminal gangs which make enormous profits to the detriment of helpless victims”.